Space Center Houston and NineSigma partnered to present the Space Robotics Challenge with NASA’s Centennial Challenges Program. Robotics enthusiasts from around the world traveled to Space Center Houston for the culmination of the Space Robotics Challenge June 29 and 30, 2017. Visitors got a glimpse into the future of robotics and celebrated the conclusion of this pioneering competition at the Space Robotics Challenge Celebration. The two-day celebration included a Thought Leader Series event in Mission Briefing Center. Visitors learned about the future of robotics from panelists Kimberly Hambuchen, deputy manager for NASA’s Human Robotic Systems project, Luis Sentis, associate professor of aerospace engineering at the University of Texas at Austin, Dr. Ana Huaman Quispe, post-doctoral researcher at TRACLabs and Dr. Marcia O’Malley, professor of mechanical engineering, of computer science, and of electrical and computer engineering at Rice University. Hambuchen has been a robotics engineer in the software, robotics and simulation division of NASA since receiving her doctorate in electrical engineering from Vanderbilt University in 2004. Sentis leads the Human Centered Robotics Laboratory, an experimental facility focusing on control and embodiment of humanoid robots. Quispe’s research focuses on designing algorithms to enable robots to perform essential manipulation tasks such as pick-and-place, pouring and handovers. O’Malley’s research addresses issues that arise when humans physically interact with robotics systems. Visitors watched a live robotics challenge, similar to a hackathon, from 10 a.m. to 1 p.m. on June 30. The challenge featured members of the Top 20 teams mentoring greater Houston-area high school students to complete a robotic task. They put their coding skills to work and wrote code to navigate a robot through a space exploration challenge. The second day also included interactive educational activities for visitors of all ages. The celebration concluded with an awards ceremony announcing the winners of the live challenge as well as the Space Robotics Challenge winners June 30 in Astronaut Gallery. Watch a video of the ceremony on our Ustream channel. 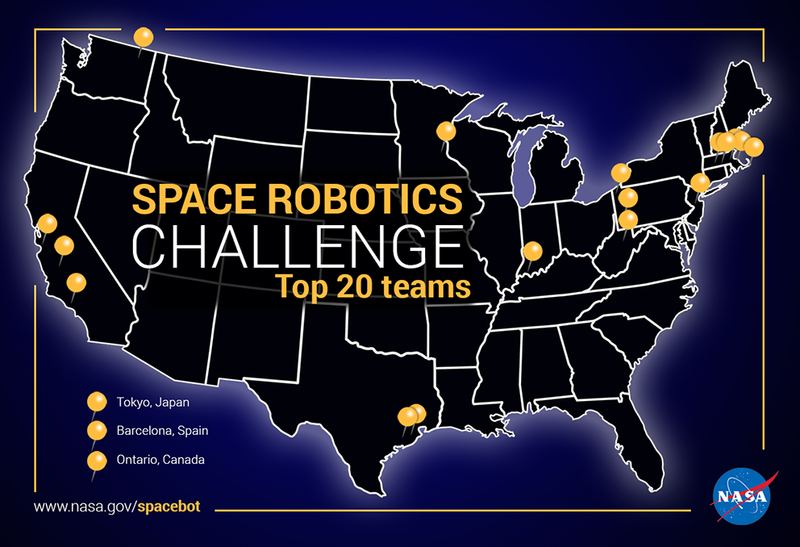 The Space Robotics Challenge focuses on developing software to increase the autonomy of dexterous mobile robots in humanoid format during space travel and on planets. It focuses specifically on NASA’s Valkyrie robot (also known as Robonaut 5 and R5). More than 400 teams from 55 countries preregistered to compete in the challenge and win their share of the $1 million prize pool. Ninety-two of those teams progressed to the qualifying round where they were tasked with demonstrating a simple technological advancement. From those 92 teams, the top 20 finalists were selected. The finalists come from across the United States as well as Japan and Spain. They comprise friends, professionals and academic colleagues from educational institutes such as Carnegie Mellon University, Tufts University and Worcester Polytechnic Institute. The top 20 teams completed the open practice phase of the challenge which precedes the virtual competition on June 16. For the final competition, teams worked within the virtual challenge scenario that had been created as a backdrop for developing coding advancements that enable the autonomy of humanoid robotics. The Space Robotics Challenge is one of Space Center Houston’s many educational initiatives intended to inspire all generations through the wonders of space exploration. Click here to learn more about our education programs. Representing three major cities in Texas — Houston, Dallas and Austin — this team is using the competition as a platform to build an understanding of modern robotics and computer science and further pave the way for this evolving field into unchartered territory. Given the potential prize money allocated in this competition, the team hopes to pay for college tuition and initiate more robotics and programming projects as a means of inspiring innovation outside of the classroom. BIT PLEASE team members are using this competition to acquire new knowledge and strategies as a tool to broaden their horizons on future implications of the field of robotics. This one-man team from California previously competed in other robotics challenges. The team name derives from the required dexterous control of a robot to coordinate sensors and actuators. Hoping to win prizes and learn more about humanoids, Coordinated Robotics will focus on manipulation of humanoids to excel in the competition. With a team name representing Mingo Mountain in his home state of Washington, this one-man team previously competed in a robotics challenge. Also acting as a mentor for a local high-school robotics team, the individual has extensive experience with networking and programming tools. Intending to use the prize money for everyday expenses if he is dubbed a finalist, Ringer hopes to improve his robotics skills while exploring new approaches to technology. The six team members love cutting-edge technologies, especially in robotics and space exploration. With expertise in artificial intelligence reasoning algorithms and developing functioning robots, the team believes its extensive knowledge of robotics will allow expandability and increased interaction between humans and humanoids. Although the MITs are not eligible for the prize money, they hope the challenge will provide them with a legitimate sample case regarding how autonomy technology will be used in the future of space missions. This long-time embedded software developer works with robots to keep his skills intact and have fun during retirement. He received honors participating in previous Centennial Challenges. The team name comes from Mystic Lake Software, which is based on a small lake behind his home in Texas. It reflects the aura of mystery people have regarding software. He plans to invest, take a vacation with his wife and buy more robots if he is awarded the prize money. Learn more about Team Mystic at mysticlakesoftware.com. After attending college and spending eight years in the military, this New Jersey resident is exploring possible careers. The team name was chosen because people often believe he was named after Edgar Allan Poe, who used the phrase “nevermore” in his poem The Raven. His interests include training for Ninja Warrior, playing guitar and volunteering for disaster relief. Six people affiliated with Tufts University in Massachusetts who frequently work with human-robot interaction are competing in hopes of funding research efforts for their lab. The team name comes from composer Richard Wagner’s opera Der Ring des Nibelungen, which features a Valkyrie, the same name used for the robot in the Space Robotics Competition. In their spare time, several team members play in the lab band. A Massachusetts native is the brains behind the operation of the team Sirius. If he is awarded the prize money, he plans to purchase capital equipment for robotics efforts. Building robotics for work and fun, Barry is looking to further develop and test image recognition in R5. Hoping to fund resources for robotics hardware and eventually their own startup, these team members are all professional and academic colleagues with strong programming and systems experience. The three-person team from California has a wide variety of interests aside from robotics, some of which include karate, hiking and learning new languages. Five full-time robotics engineers from Pittsburgh, Pennsylvania are representing SpaceBucs in the Space Robotics Challenge. SpaceBucs has competed in other robotics challenges and plans to leverage their previous knowledge and experience to implement new software quickly. The team members’ expertise in software perception, planning and implementation is well-suited to complete the challenge tasks. These three family members from Canada hope to fund a robotics company if awarded the prize money. One member was a level-one winner in previous NASA Centennial Challenges under Team AL. The addition of v2.0 in the team name signifies that the team has been modified and is ready to compete. The team captain has enlisted the help of her father and cousin, who both have mathematic and robotic experience, for the Space Robotics Challenge. Ten robotics and software specialists representing six countries make up this team, named for the largest discovered volcano in our solar system which is located on Mars, where the simulated competition occurs. The team members are all current or former employees at PAL Robotics who have stayed in touch throughout the years. Although they are not eligible for prize money, they entered the competition to have fun and become more involved in simulated space exploration. This Indiana resident named his team after Olrun, a Valkyrie from Norse mythology. Bolenbaugh is participating in the challenge to build sufficient robotics experience and hopes to operate a robotics business and hire a partner if awarded the prize money. Seven American and Hungarian expats with diverse professional backgrounds make up the team THE HUMANZ ARE DEAD. Formed during a robotics competition in 2015, the team name was chosen as a tribute to the song “The Humans Are Dead,” by Flight of the Conchords. If awarded the prize money, THE HUMANZ ARE DEAD will use it to fund their engineering projects and other robotics competitions. The main goal of the team is to learn about and contribute to the exciting field of autonomous robotics for space exploration. The Whalers is made up of a mathematics teacher and a student at a high school in Massachusetts. Hoping to buy a robot if they are awarded the prize money, The Whalers are interested in high-level, state-of-the-art robotics. One of the team members has competed in other robotics challenges, and hopes his experience will attribute to The Whalers progression throughout the Space Robotics Challenge. Team Walk Softly joins the fray from upstate New York. The team name is reminiscent of a phrase often attributed to former President Theodore Roosevelt, “speak softly and carry a big stick – you will go far.” Team members are coworkers at GE Global Research who have an interest in humanoid robots and decided to enter on their own time. The team is excited to see the innovative solutions that come out of this challenge. With a whopping 39 team members, this team has participated in other robotics challenges and hopes to win the prize money to support students researching humanoid robotics. Sponsored by Worcester Polytechnic Institute in Massachusetts, the team will use software development and the minds of many enthusiastic and smart students to excel in the competition. Three robotics researchers from West Virginia make up the WV Robotics Team. With extensive experience in systems and robotics engineering, the team hopes to increase autonomy in humanoid robots. This California resident grew up with a fascination for space and technology and is a self-taught programmer, with a passion for robotics engineering. If Xion Systems is a prize recipient, the money will be used to pay college expenses and eventually fund a research lab for innovative humanoid technologies. These four engineers and programmers based in Minnesota have been interested in NASA’s Centennial Challenges for four years, but did not have the time or resources to enter. If awarded prize money, they plan to distribute it equally between team members to defray some competition travel costs.